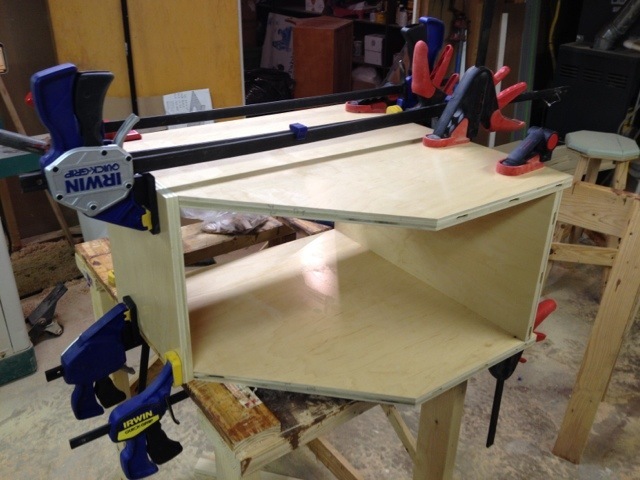 Glued up one of the corner cabinets today. I’m using a my Festool Domino to cut some mortises so that I can use floating tenons to attach the sides. This is a but different than the typical way, which would ne to use dado’s and screws. I’m not entirely sure that using the dominos is a better way, but it seems to work pretty well (except when I muck up the domino positioning that is). For the regular cabinets the glue-up is straight forward, however for the corner cabinets things get a bit tricky. Trying to layout the dominos such that everything can be assembled is diffiult, but once I managed that it wasnt to bad to glue it up.